My first layout is Holiday Cheer using papers from an older Basic Grey collection and tinsel looking silver papers from DCWVs Crisp Luxury Stack. To give my little triangle tree a retro tinsel look, I used my Ball brand herb cutting scissors - which are exactly the same as fringe scissors, but cheaper. This page is my example layout for one of the exclusive sketches for the members of the "White Glove Level" at Disney Scrappers. 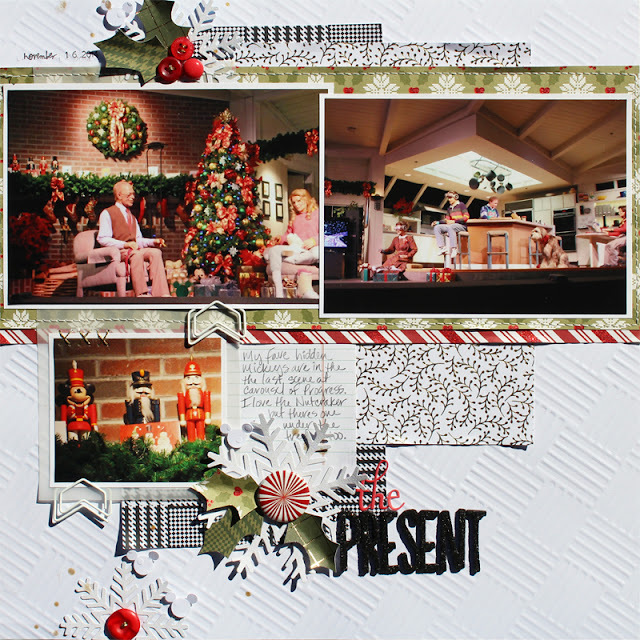 This next layout has photos of the last scene in the attraction Carousel of Progress at DisneyWorld. This scene is Christmas time so I wanted to do a Christmas theme. We have always loved this attraction. I used a paper from the DCWV Embossed White stack for the background. The other papers are from the DCWV Plaid Stack and another holiday stack as well. Hooray for Christmas in March! I love that title with the OA record. It’s seriously fabulous! And a great photo of you two.